Today’s guest blogger is Tamara Bradshaw, a jewelry collector and regular contributor to Show & Tell. You can stay incredibly up-to-date and stylish while wearing costume jewelry. I prefer vintage pieces for several reasons. For one, the quality is better. Secondly, they’re not made in China (it’s shocking how many “American” brands are made overseas). Lastly, I usually find these items at great prices. Take this current trend: Layering those bangles and bracelets. Within the last few days, I have seen this look in a “Glamour” magazine photo spread, a Subaru commercial, and on a segment for weddings on Nate Berkus. 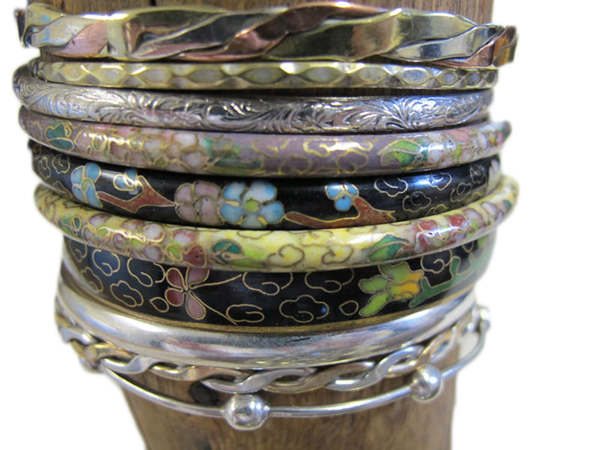 The preference for piling on bangles on bare arms began in the 1920s with the flapper movement. But these days, this can be done with all kinds of bracelets—wood, plastic, silk wrapped, gold and silver linked. At first I was hesitant, thinking I wouldn’t like it, but it actually looked good! 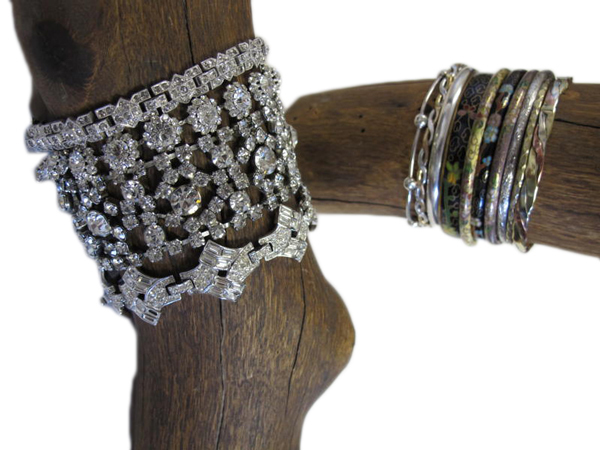 I used four vintage clear rhinestone bracelets for one and a mixture of 10 bangles in silver plate, brass, and cloisonné in the other. Try it for yourself. Of course, if you want you can go and buy these jewelry styles at most retail stores. But where’s the fun in that? I have always loved jewelry, mostly the older pieces, and have begun to collect them. As I have a few that are damaged, I am need of instruction on how to use them in updated fashions. Can you recommend any resources? Hi Beth! If you have some cool older pieces and you are looking for ideas on how to wear them or get them fixed. Post it on collectors weekly, you are bound to get a lot of suggestions. It’s pretty easy to do and I would love to see them! “ ” It is as impossible to reproduce the odor of flowers as it is to imitate the bloom of their texture.